Worried by the rising incidents of drug abuse, particularly among youths, the Senate, on October 10, 2017, adopted a motion signifying its resolve to confront the challenge head on. Adopting the motion sponsored by Senator Baba Kaka Garbai (APC, Borno) and 37 other senators, the Senate resolved to mandate its joint committee on drugs and narcotics and health to advise it on how to combat the menace. Garbai, while presenting the motion, had noted that the misuse of pharmaceutical drugs was plaguing the teeming population of youths, particularly in northern Nigeria, saying, “While drug abuse, especially that of heroin, cannabis and cocaine, has for long been a problem among northern male youths, Codeine cough syrup, Tramadol and other substances were becoming the new cancer ravaging women and girls in the North”. 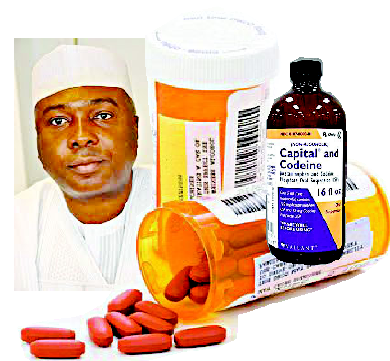 Consequently, Senate President Bukola Saraki vowed to lead the crusade against the development by immediately setting up a technical committee to, in conjunction with the relevant Senate committees, organise a stakeholders’ roundtable dialogue aimed at finding solution to the widespread use, abuse and distribution of drugs across the country. Saraki, in a barrage of tweets on his handle @BukolaSaraki, said the two-day event will send a clear message about the Senate’s resolve to tackle drug abuse. “The #DrugAbuse epidemic has been of a particularly virulent nature, touching all social strata and afflicting families and young lives. Not even nursing mothers are spared; future generations are already endangered”, he said in one of the tweets. The roundtable held between December 18 and 19, 2017 in Kano, believed to be the hub for drug and substances abuse, witnessed the attendance of top officials of relevant federal and state governments, regulatory and enforcement agencies, top northern traditional rulers, including the Emir of Kano, Muhammadu Sanusi II, religious and political leaders, youth organisations and other stakeholders. The quality of the attendance and contributions at the event underscored how appreciative opinion leaders and ordinary people of the North were with the initiative. In his remarks at the event, Saraki said: “To kick-start the process of bringing this epidemic under some control, we need to inquire into the strengths and weaknesses of the current policy and its implementation – as well as to understand the ways in which legislation and advocacy might improve. Presentations at the roundtable, no doubt, exposed the weaknesses of the strategies adopted in the fight against drug abuse in Nigeria as encapsulated by one of the participants who is a lecturer at Bayero University, Kano, Dr Bala Muhammad. Muhammad noted that, from the submissions by the various regulatory and enforcement agencies at the event, there was a clear disconnect and lack of synergy among them, adding that it appeared that each agency is on its own, doing what it feels is okay independently. High point of the two- day session was the testimony of an ex-drug addict, a lady in her late 20s, who, while covering her face with veil, explained how she got into the destructive habit and gave details of how she carried on until she was rescued. Registrar of the Council, Mr Elijah Mohammed, who disclosed this, said the group, which would consist of regulatory bodies and other stakeholders, would assist in the implementation of a communication strategy in the pharmacies and the patent and proprietary medicine vendors’ shops in various communities. Reacting to the PCN intervention, the Senate President took to his Facebook and Twitter pages saying, “It is great to see the PCN taking an active stance against the abuse of codeine and other drugs after the #SenateTacklesDrugAbuse Roundtable. This is a welcome development. “As PCN constitutes this group to control the distribution of Codeine and other drugs in Nigeria, my colleagues and I in the 8th Senate will continue working to provide the necessary legislative interventions to fight #DrugAbuse across the nation”. With the successful hosting of the roundtable, a situation endeared the Senate President and the Senate to Nigerians for what is considered a timely intervention to arrest a potential humanitarian crisis, particularly in the North, the ball is now in the court of the lawmakers to do the needful through legislative and budgetary provisions. The post ‘New cancer’ threatens women, girls in the North appeared first on Vanguard News.